Art runs in the Vandermark family. That artistic bent seems to have made its way to his son, Rob. He works in sign, leather, and wood sculpture. “One mistake has set Rob in a secure institute for life,” says Bob. In spite of being incarcerated for more than 17 years, Rob has continued to be creative. Rob’s most recent creations — decorative cedar balls — are available for purchase through his dad. 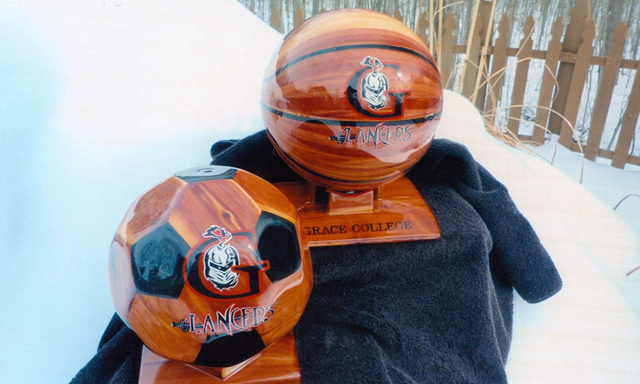 He’s created basketballs, soccer balls, and footballs, complete with team logos. For more information, call Bob Vandermark at (260) 327-3462. Bob and his wife, the former Barb Witt, are members of the Winona Lake, Ind., Grace Brethren Church (Bruce Barlow, lead pastor).